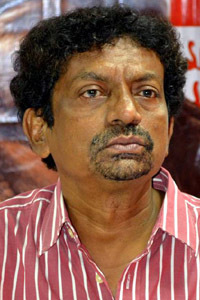 Goutam Ghose was born on 24 July 1950 in Calcutta, India to Santana and Prof. Himangshu Kumar Ghose. His kindergarten days began at the St John's Diocesan School (now an all-girls school). He studied there till class 4 and then moved to the neighboring Cathedral Missionary Boys' School. He graduated from the University of Calcutta. He started making documentaries in 1973. Took active part in group theatre movement in Calcutta. Also dedicated some time as a Photo Journalist. Made his first documentary– New Earth in 1973 followed by Hungry Autumn which won him the main award at the Oberhausen Film Festival. Has since made ten feature films including Maa Bhoomi, Dakhal, Paar, Antarjali Yatra, Padma Nadir Majhi, Patang, Dekha, Abar Aranye, Gudia, Kaalbela & Moner Manush. Has made a number of prominent documentaries including Meeting A Milestone (on Ustad Bismillah Khan), Beyond the Himalayas, Land of Sand Dunes, Ray (On Satyajit Ray), Impermanence (On HH Dalai Lama) Made numerous AD films, corporate and other Short Films. Has won 16 National Awards (excld 2008) besides Filmfare Awards and many International awards like Silver Balloon Award, Nantes Film Festival, UNESCO Award, Cannes Film Festival, Grand Prix - Golden Semurg at Tashkent, UNESCO Award at Venice, Fipresci Awards, Red Cross Award at Verna Film Festival. Also the only Indian to win the coveted Vittorio Di Sica Award. Was awarded the Knighthood of the Star of the Italian Solidarity in July 2006.